Latest Free stuff is a really great app that displays a range of products and samples that are free. This includes anything from McDonalds and Starbucks coupons to promotional free items. The idea of using an app to stay on top of free offers is really great. 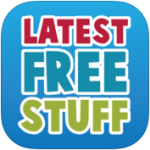 Latest Free Stuff has a wide range of free things and is constantly updated. I’m not sure why anyone would not download this app. It’s simply a must-have and will save you some money in the long-run if you make use of the free things you find using Latest Free Stuff.